"The inexorable rise of open access scientific publishing". Our (Gargouri, Lariviere, Gingras, Carr & Harnad) estimate (for publication years 2005-2010, measured in 2011, based on articles published in the c. 12,000 journals indexed by Thomson-Reuters ISI) is 35% total OA in the UK (10% above the worldwide total OA average of 25%): This is the sum of both Green and Gold OA. Our sample yields a Gold OA estimate much lower than Laakso & Björk's. Our estimate of about 25% OA worldwide is composed of 22.5% Green plus 2.5% Gold. And the growth rate of neither Gold nor (unmandated) Green is exponential. There are a number of reasons neither "carrots vs. lettuce" nor "UK vs. non-UK produce" nor L&B estimates vs. G et al estimates can be compared or combined in a straightforward way. Please take the following as coming from a fervent supporter of OA, not an ill-wisher, but one who has been disappointed across the long years by far too many failures to seize the day -- amidst surges of "tipping-point" euphoria -- to be ready once again to tout triumph. 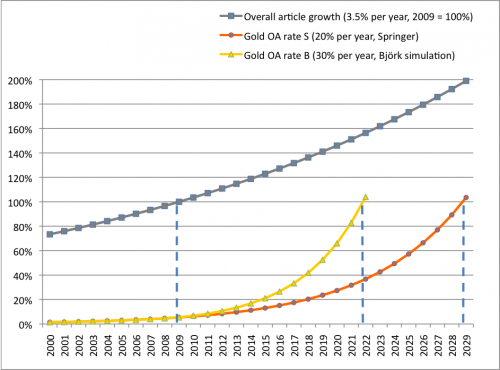 First, note that the hubbub is yet again about Gold OA (publishing), even though all estimates agree that there is far less of Gold OA than there is of Green OA (self-archiving), and even though it is Green OA that can be fast-forwarded to 100%: all it takes is effective Green OA mandates (I will return to this point at the end). 1. Thomson-Reuters ISI Subset: Our estimates are based solely on articles in the Thomson-Reuters ISI database of c. 12,000 journals. This database is more selective than the SCOPUS database on which L&B's sample is based. The more selective journals have higher quality standards and are hence the ones that both authors and users prefer. 2. Embargoed "Gold OA": L&B included in their Gold OA estimates "OA" that was embargoed for a year. That's not OA, and certainly should not be credited to the total OA for any given year -- whence it is absent -- but to the next year. By that time, the Green OA embargoes of most journals have already expired. So, again, any OA purchased in this pricey way -- instead of for a few extra cost-free keystrokes by the author, for Green -- is more of a head-shaker than occasion for heady triumph. 4. 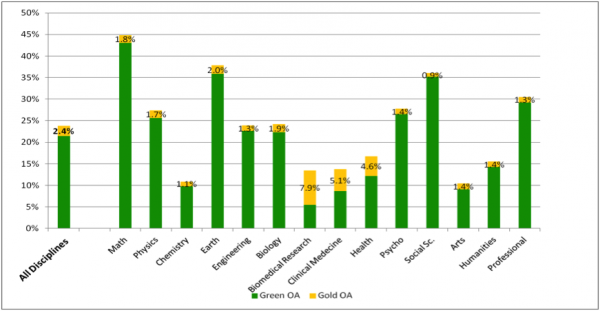 Green Achromatopsia: The relevant data for comparing Gold OA -- both its proportion and its growth rate -- with Green come from a source L&B do not study, namely, institutions with (effective) Green OA mandates. 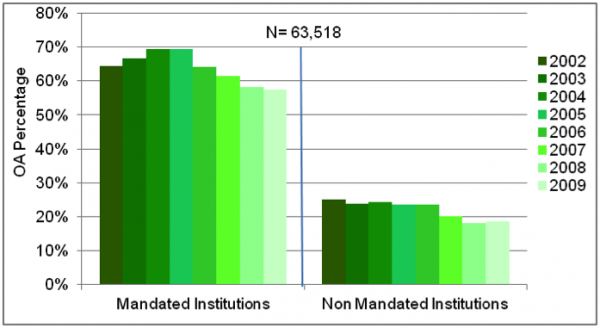 Here the proportions within two years of mandate adoption (60%+) and the subsequent growth rate toward 100% eclipse not only the worldwide Gold OA proportions and growth rate, but also the larger but still unimpressive worldwide Green OA proportions and growth rate for unmandated Green OA (which is still mostly all there is). 5. Mandate Effectiveness: Note also that RCUK's prior Green OA mandate was not an effective one (because it had no compliance verification mechanism), even though it may have increased UK OA (35%) by 10% over the global average (25%). Stephen Curry: "A cheaper green route is also available, whereby the author usually deposits an unformatted version of the paper in a university repository without incurring a publisher's charge, but it remains to be seen if this will be adopted in practice. Universities and research institutions are only now beginning to work out how to implement the new policy (recently clarified by the RCUK)." Well, actually RCUK has had Green OA mandates for over a half-decade now. But RCUK has failed to draw the obvious conclusion from its pioneering experiment -- which is that the RCUK mandates require an effective compliance-verification mechanism (of the kind that the effective university mandates have -- indeed, the universities themselves need to be recruited as the compliance-verifiers). Instead, taking their cue from the Finch Report -- which in turn took its cue from the publisher lobby -- RCUK is doing a U-turn from its existing Green OA mandate, and electing to double-pay publishers for Gold instead. A much more constructive strategy would be for RCUK to build on its belated grudging concession (that although Gold is RCUK's preference, RCUK fundees may still choose Green) by adopting an effective Green OA compliance verification mechanism. That (rather than the obsession with how to spend "block grants" for Gold) is what the fundees' institutions should be recruited to do for RCUK. 6. Discipline Differences: The main difference between the Gargouri, Lariviere, Gingras, Carr & Harnad estimates of average percent Gold in the ISI sample (2.5%) and the Laakso & Bjork estimates (10.3% for 2010) probably arise because L&B's sample included all ISI articles per year for 12 years (2000-2011), whereas ours was a sample of 1300 articles per year, per discipline, separately, for each of 14 disciplines, for 6 years (2005-2010: a total of about 100,000 articles). 9. RCUK Compliance Verification Mechanism for Green OA Deposits: I certainly hope Stephen Curry is right that I am overstating the ambiguity of the RCUK policy! But I was not at all reassured at the LSHTM meeting on Open Access by Ben Ryan's rather vague remarks about monitoring RCUK mandate compliance, especially compliance with Green. After all that (and not the failure to prefer and fund Gold) was the main weakness of the prior RCUK OA mandate.